Post-Wedding Gown Care, What do you do with your dress now? 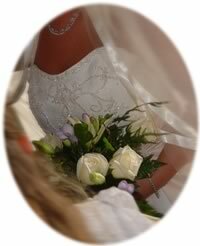 After the wedding, the last thing on your mind will be getting your gown cleaned. 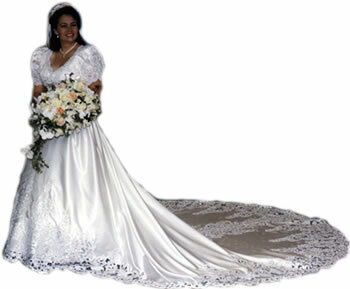 But taking the time to preserve your gown as soon as possible will ensure its pristine condition. If you can't see to it immediately, ask a bridesmaid or relative to do it for you. Before taking the gown to the dry cleaner, check it carefully for stains. If possible, note the type and location of each stain. This will help your dry cleaner eradicate them more easily. To box or not to box? No storage system is completely safe or will completely prevent age discoloration of fabric. A professionally boxed gown is sealed in an airtight picture-window box in acid-free tissue, preserved for future generations. If you decide not to box your dress, store it flat to prevent fabric stress from a hanger. Stuff the sleeves and bodice with acid-free tissue, and line the skirt with the same tissue. Wrap the dress carefully in unbleached cotton or linen. Boxed or unboxed, make sure your freshly cleaned dress is in a dark, dry place.